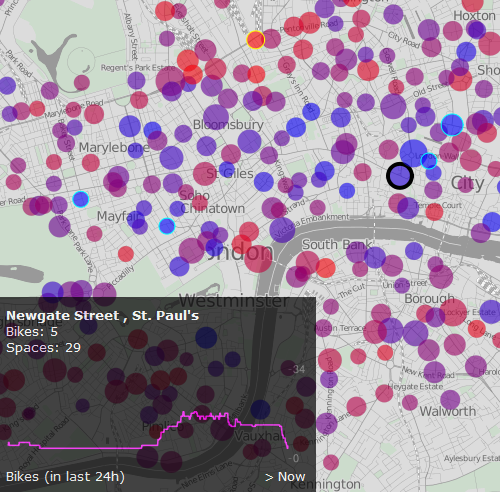 Oliver O'Brien, Research Associate at UCL's Centre for Advanced Spatial Analysis, has used TfL's open-source data on cycle hire usage to create this wonderful interactive visualisation of how the bikes are being used. The chart colour-codes how busy each station is in real-time, and how often bikes are used over the previous 24 hours. Some of the early patterns are rather predictable: during weekday mornings a lot of bikes tend to be deposited at stations in the Square Mile, and in the evening there's a big shift of cycles towards the mainline stations; they're not used so much in inclement weather or during the weekend, and a disproportionate number of bikes tend to end up in Pimlico, which O'Brien notes in a related blog post, is perhaps the most populated residential area covered by the scheme. This is but the latest in a number of recent visualisations, including London's Twitter traffic (which also came by way of the Centre for Advanced Spatial Analysis), London's most photographed bits, and the Tube trains mapped in real time, which proved so popular that it has unfortunately been taken offline.